Three-phase partitioning (TPP) is a technique to extract, separate and purify components, e.g lipids, enzymes, polysaccharides and other biomolecules, from biological material. The ultrasonically assisted three-phase partitioning excels the conventional TPP by higher yield, improved purity and exceptional speed. Ultrasonic TPP is applicable for small and large volumes and can be easily scaled to industrial production. Three-phase partitioning (TPP) is a simple and efficient one-step process for the separation, purification and concentration of biomolecules such as enzymes, lipids, polysaccharides etc. from complex mixtures. TPP is performed by the sequential addition of a sufficient amount of salt (typically ammonium sulphate) and an organic solvent (mainly t-butanol/tert-butanol). Salts such as ammonium sulfate are used at a certain saturation to precipitate the protein. An organic solvent such as t-butanol is added to form three-phase layers and to remove low molecular weight compounds such as lipids, phenolics and some detergents. Since t-butanol has a high boiling point, but less flammable than ethanol and methanol, t-butanol is the preferred solvent for TPP. After the treatment of the crude extract and the decantation, the mixture separates into three distinct phases: the upper solvent (t-butanol) phase contains non-polar compounds, which are separated from the lower aqueous phase (containing polar compounds) by an interfacial protein precipitate. The desired proteins are selectively partitioned to one phase and other contaminant proteins to the other phase. This causes partial purification and concentration of the protein. 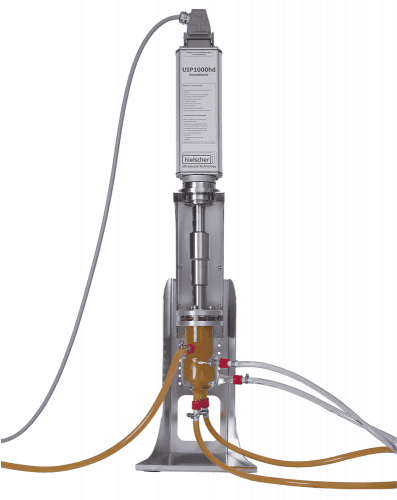 The extraction process is an amalgamation of kosmotropic, salting out, isotonic cosolvent and osmolytic precipitation of proteins. Sonication intensifies the TPP process significantly. Ultrasonically assisted TPP is successfully applied for the separation and purification of biomolecules. A wide range of biomoelcules have been isolated more efficiently in shorter time. For instance, enzymes from plants (e.g. bromelain, papain, invertase, polyphenol oxidase and trypsin inhibitors), animals (e.g. trypsin, α-chymotrypsin, chymosin, pepsin and luciferase) and microbes (e.g. lipase, α-amylase, α-galactosidase, serratiopeptidase, cyclodextrin glycosyltransferase, and fibrinolytic enzymes) were purified via ultrasonic TPP. An additional benefit of the ultrasonic TPP is the enhanced activity of various enzymes, resulting in apparent higher yields (>100%) since the targeted enzyme or protein precipitates out in the middle layer between the organic and aqueous phases. Ultrasonic TPP can be used effectively with crude samples and can be easily scaled up. Sonication improves three-phase partitioning significantly and results in higher yield and purity in drastically shorter process time. Andrographolide is a labdane diterpenoid, which is valued for its high anti-inflammatory, antioxidant, hepatoprotective, anti-carcinogenic and anti-diabetic effects. Comparative studies show that ultrasonic TPP not only increased the yield of andrographolide but also improves the antioxidative activity compared to conventional TPP. 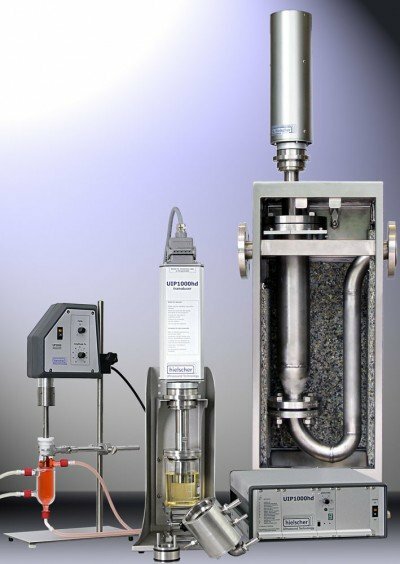 Hielscher Ultrasonics is specialized on the design and manufacturing of high-power ultrasonic systems for extraction as well as many other processes. Our product range covers small, powerful lab devices, robust bench-top ultrasonicators and industrial high-performance systems. The manifold accessories allow for the ideal adaption of the ultrasonic system to your specific process requirements. All Hielscher ultrasonicators are built for 24/7 operation under full load. Our long-time experience in ultrasonic processing allows us to consult our clients from their first tests with ultrasound through the steps of process optimization and implementation on industrial scale. Please use the form below to tell us about your process! We are glad to recommend discuss the opportunities and benefits of sonication for your application. 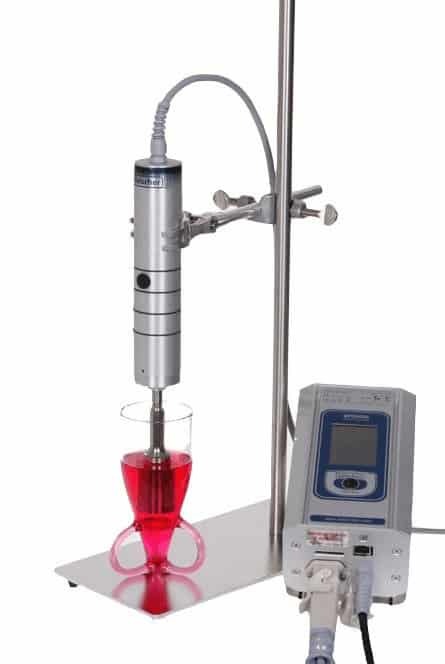 Powerful and reliable ultrasonic equipment from lab to industrial scale. Chougle, J.A: et al. (2013): Ultrasound assisted three phase partitioning (UATPP): A novel technique developed for extraction of astaxanthin from Paracoccus NBRC 101723. CSBE/SCGAB 2013 – Annual Conference University of Saskatchewan, Saskatoon, 7-10th July 2013. Ketnawa, S. et al (2017): Phase partitioning for enzyme separation: An overview and recent applications. International Food Research Journal 24(1), 2017. 1-24. Varakumar, S. et al. (2017): Enhanced extraction of oleoresin from ginger (Zingiber officinale) rhizome powder using enzyme-assisted three phase partitioning. Food Chemistry 216, 2017. 27–36. Yan J.-K. et al. (2018): Ultrasound synergized with three-phase partitioning for extraction and separation of Corbicula fluminea polysaccharides and possible relevant mechanisms. Ultrasonics Sonochemistry Vol. 40, Part A, 2018. 128-134. TPP is a bioseparation technique, based on partitioning of polar constituents, proteins, and hydrophobic constituents in three phases comprising of water, ammonium sulphate and t-butanol. Manifold important therapeutic and industrial enzymes (e.g. α-galactocidase, α-amylase inhibitors, and protease) and natural compounds (e.g. diterpenes such as forskolin and andrographolide) are purified by three phase partitioning. Whilst pigments, lipids and enzyme inhibitors accumulate in the upper solvent phase, which is separated from the lower aqueous phase, where polar components like saccharides are accumulated, by an intermediate protein precipitated layer. 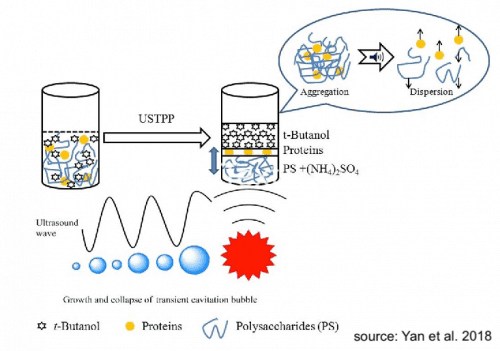 Since t-butanol binds TPP-precipitated proteins, which occur as protein-t-butanol coprecipitates, it floats in between organic and aqueous layer and can be easily separated and purified. In general, biomolecules are recovered in a purified form at the interphase, while the contaminants mostly partition to t-butanol (top phase) and to the aqueous phase (bottom phase). Astaxanthin (3, 3´-dihydroxy-ß, ß-carotene 4, 4´-dione) is a keto-carotenoid that belongs to the class of terpenes. As tetraterpenoid it is built from five carbon precursors, isopentenyl diphosphate, and dimethylallyl diphosphate. Astaxanthin is a yellow-orange plant pigmant and therefore classified as a xanthophyll. Astaxanthin is mainly found in microalgae, yeast, salmonoids, trout, krill, shrimp, crayfish, and crustaceans. As an highly potent free radical scavenger, skin protectant, anticarcinogenic and as an enhancer of immune system, astaxanthin is used as supplement and as additive in foods, pharmaceuticals and cosmetics. 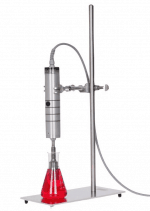 Ultrasonic TPP improves the extraction and separation process of astaxanthin from natural sources and makes its economical production applicable to industrial level.